At Steve’s Camaros, our goal is to make it easier than ever for Camaro enthusiasts to get the parts they need to restore or modify their Camaros. While we specialize in replacement parts for ‘67 to ‘69 Camaros, we have plenty of other Camaro part options for many other models up through 1981. One of the biggest benefits we provide to our customers is the ability to purchase Camaro parts online. If you know exactly what you’re looking for, why should you have to waste your time driving out to the supplier? Convenience: Again, the ability to shop from home and not have to drive out to a specialty supplier is a tremendous advantage that we offer our customers. For many Camaro enthusiasts, finding a parts store that actually carries what they need can be extremely difficult. Rather than having to drive all over the state, you are able to simply find the part you need on our site and place your order quickly. Variety: We carry a tremendous variety of custom Camaro parts. While we do not offer drive trains or drive train parts, we have just about everything else you could possibly need to restore your Camaro to pristine condition. Our inventory is just as good, if not better, than most suppliers you’d visit in person, and you don’t have to spend the time walking up and down the aisles trying to find the exact part you need. We have over 4,000 different types of parts in stock, with multiples of each, giving us an inventory of tens of thousands of Camaro parts. This makes us the best source for parts in the entire Camaro industry. New and used: We sell both new and used parts online, including some extremely difficult-to-find original parts. This provides you with valuable savings opportunities or the chance to restore your vehicle to as close to mint condition as possible. Impeccable knowledge and reputation: We have earned a reputation as the best Camaro parts shop in the nation. This reputation did not happen overnight—we have built it through hard work and dedicated service since our company was founded in 1976. When you work with Steve’s Camaros, you know you are dealing with people who love Camaros and know what they’re talking about. Fast shipping: All of our parts are in stock and ready to go immediately. In fact, we are able to ship to most places in the United States faster than just about any traditional shop. If your order is mostly made up of sheet metal, we can save you money by drop shipping from our Los Angeles or Atlanta distributors, directly from our warehouse. If you’re in the area, you can even feel free to come by and pick up the part in person. The convenience, affordability and comfort that come with shopping for Camaro parts online cannot be understated. Contact us today at Steve’s Camaros for more information. There are classic Camaro enthusiasts all over the United States, and at Steve’s Camaros, we have the honor of being one of the most trusted and highest quality Camaro parts dealers in the nation. Since our founding in 1976, we have built our reputation on outstanding customer service, a tremendous variety of parts (both new and used) and the fact that our items are constantly in stock. We are even able to provide customers with rare items that they would not find at most other dealers. High quality: All of our Camaro parts represent the very best of General Motors and officially licensed GM Restoration Parts, from Detroit Speed and Engineering, Original Equipment Reproduction (OER), Classic Headquarters (CHQ), Dynacorn, P.U.I., Auto Metal Direct, American Autowire, Metro Molded Parts, TrimParts, The Right Stuff Detailing, Shiftworks and a number of the other leading manufacturers whenever possible. This ensures our customers are getting the highest quality of manufacturing and technical standards for their restorations. Outstanding variety: We sell classic Camaro parts in categories such as AC and heater, audio and security, body components and panels, brakes, car care, cooling system, dash components, electrical and wiring, emblems and decals, engine, exhaust, exterior trim, fuel system, ignition system, interior hard parts, interior soft goods, lifestyle products, lighting, paint and chemicals, rear end, steering, suspension, tools, transmission, weatherstrip and wheels/tires. Fast shipping: All of our items are in stock and prepared to ship when you order. As a result, we are able to get your item shipped out to you faster than most other stores you’ll find. Of course, if you are located near our warehouse, you are more than welcome to come and pick up your order in person as well. New or used: We offer both new and used parts to give you the best option for your build and your budget. Some people prefer only brand new parts, so we make sure to carry plenty in stock. Regardless of what you’re looking for, it’s guaranteed to be in stock in our two-story warehouse. Specialty years: We carry parts from 1967 through 1981. However, we specialize particularly in parts for Camaros from 1967 to 1969. We believe these to be the “golden years” of the Camaro, and have long held a great passion for restoring these cars. Many collectors make us their go-to source for all of these parts because of our knowledge and passion for these models, and for the excellent availability of parts we have on hand. All online: You do not have to come to our warehouse if you’re looking for a specific part. Instead, everything we have is also listed online for you to easily purchase from the comfort of your home. This is especially beneficial for collectors who live some distance away and do not have the time to drive out to our location. For more information about the classic Camaro parts we sell at Steve’s Camaros, contact us today. Who ever said you can’t go back, never enjoyed this car for 33 years. The 8 year restoration was finally completed in September of 2014. The first drive out of the parking lot was surreal to say the least. Looking through the windshield across the two banks of re-chromed hood louvers just sent me back to 1981 when I purchased the car from Steve. I drove the car almost every day through the 80’s. It’s ridiculous to think of this car as a commuter between SF and Oakland. It survived the college years, early career years and a first marriage. The car always made commuting fun but gas, insurance and some maintenance were brutal on a limited budget. That was many years ago. My second wife, now of 2o years always understood my attachment to this car. She deserves a tremendous amount of credit and kudos for her encouragement and support during this long process to getting it back on the road. It’s a valid question to ask why a 1969 Camaro with plenty of great muscle car options out there. I believe to each their own and respect individual passion but the lines, power, ergonomics and race lineage made it obvious to me. I knew I only wanted a ’69 Camaro with a 4 speed and the must have RS option. With little money, I investigated car lots like Deals on Wheels in San Bruno and religiously read the classifieds in the Chronicle. All I found was bad to worse conditions for what I could afford. My very good friend Alan Maffei introduced me to Steve Pardini in 1981. We met Steve at dawn on a clear but cold winter morning at a swap meet in S.F. My first swap meet and a morning I will never forget. Steve told us about the car and I was mildly interested. I still laugh how Alan had to talk me into buying this car. He would say persistently “Just go take a look at it!”. I resisted his pushy recommendations for a few days, thinking it’s an automatic in an awful color combination with other issues. Finally I went to see it just to shut Alan up. Steve and I went over the car. It was all there and complete (except for the smog equipment of course). The odometer showed just over 84,000 miles, which was reasonable for it’s age and appearance. Steve was familiar with the car and forth coming with its history and issues. It had been in an accident, repaired and repainted in the original Frost Green several years prior. The paint was faded with the cracking original vinyl top. The interior was tired with torn carpet and upholstery. It listed to the right due to a broken front spring and would only travel 30 miles on a tank of gas. All these issues aside, the original engine was tight and the car ran very well down the road. All the electrical items worked and it was a safe driver. Low and behold we agreed on a price and I owned a ’69 RS/SS 396 Camaro that I was originally only going to take a quick look at. Through the process of purchasing the car I developed a respect and appreciation for Steve. He was just starting his now well-known successful business out of his family’s garage at the time. I could tell quickly he was not only professional and knew his stuff but had integrity. It’s been a friendship I have valued and enjoyed since our introduction. The first thing I had to address was the float and sending unit. The gas mileage was 12 miles to a gallon in the city and the car would only travel 30 miles on the gas it could access. Very frustrating! The tank was removed with safety taken into consideration and to my surprise I found the build sheet stuck to the top of the tank. It was tattered and stained with rust from holes in the trunk. It was legible but fragile. I placed it in a thick heavy book to flatten out the wrinkles and put it away for safekeeping. The sending unit was replaced and the first repair successful. 9 months later I returned to my parents house to learn it was common to give away what you left behind. This included the book with the build sheet. A significant part of my early history with this car would be missing if I didn’t mention the Maffei Family. I’m extremely grateful for their time, talented work and sharing their wealth of knowledge. I’m confident I would not still have this car if it wasn’t for their support. With freshly recovered seats by Mr. Gene Maffei and a new carpet, I drove off to college in Seattle a few months after buying the car. It was respectable looking and reliable. The faded paint lasted a couple of years until one day I was at a coin operated car wash. Sheets of green started flying off the driver rear quarter panel among other small areas exposing the grey primer below. The 2 years outside in the wet Seattle environment had not been kind either. The rear window leak got much worse and a small spot of rot appeared at the fender. By 1985 it was time for a facelift. It was painted red with some minor bodywork addressed. Here’s where I learned researching and picking the right body shop is crucial. I prepped the car that summer, removed all the trim, chrome and sanded it to metal. I drove it to a local shop in Santa Cruz where I was living at the time. Two weeks later I stopped by to check on the progress to learn it had been sitting outside behind the shop. It was full of heavy sea air surface rust. The looming deadline of school starting was not flexible, I had to be back in Seattle the middle of August. I received the car still wet the day before leaving. I put all the chrome, trim etc. on and headed up I-5 the next morning having learned an important lesson. The scariest moment over the past 33 years was a call from Midas where it was getting a much needed exhaust system. The manager called asking me to come down to the shop but refused to say why. After much discussion, he tells me the car “fell off the lift” and to please come to the shop. It was as much as I could do to stay calm on a ride that seemed like forever. I walked into the shop to see the car up in the air still on the lift. I was confused, it looked fine to me. The manager then explained there was some miscommunication in the shop and it was a muffler stand that fell on the driver door. I took the repair money and looked at that dent for 20 years until this restoration. My over all goal was to keep the appearance of the car generally stock. I struggled over the color to the last minute. I was never a fan of the Frost Green or so I thought. I came across a late model Mustang at a show painted Heritage Green which looked close to the Camaro’s original color. The color was vibrant and bright in the sun. I asked the body shop to shoot a sample of that color and the Frost Green so I could compare the two. It was amazing to discover they are the same color. I was also relieved because there’s something wrong about painting a Chevy a Ford color! The original power front disc brakes work very well and glad I didn’t change to aftermarket. The rebuilt stock quick ratio power steering with tilt wheel makes it easy to drive. The original wood grain all around was in good shape so it was safely stored away and reinstalled. Although the upholstery lasted many miles, the original foam was turning to dust. I opted for the hounds tooth cloth this time instead of the original comfort weave upholstery. The Hotchkis TVS kit was installed many years ago, which was the second best upgrade I ever did to the car. The first was pulling off the bias ply tires and putting on new technology for the time….radials. The exterior and interior are important but the drive train defines a muscle car. The original 396 ran strong with plenty of torque until a rocker spring broke in 1986. Steve Maffei was a great help and did me a huge favor by doing his magic on rebuilding the engine to the 325hp stock specifications. Although I finally bought a second car in the early 90’s, I continued to drive the Camaro as much as possible. Like many people I know and read about, life evolves and gets more complex. My wife and I moved to Russia for work in 1995 and the car was stored with family for 6 years. 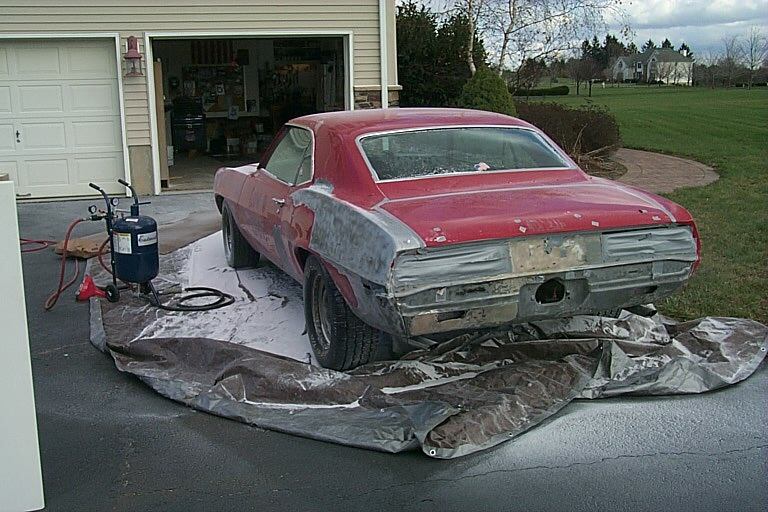 It was at this time I started squirreling away parts with Steve’s help for a someday restoration. In 2001, we moved back but this time it was to the east coast. The car was transported to our new home and with a sense of relief and excitement my old friend rolled out from the trailer. The car was shortly inspected and registered with new plates issued. It was a somber moment removing the black and yellow plates. The original plates are currently being restored with plans to swap on and off for shows along with an Ed Cordero plate frame. The driving season on the east coast is frustratingly short. The Spring and Fall weather dictate when you can drive a car you care about. I commuted now to Newark and leaving the Camaro on the street there was obviously not an option. 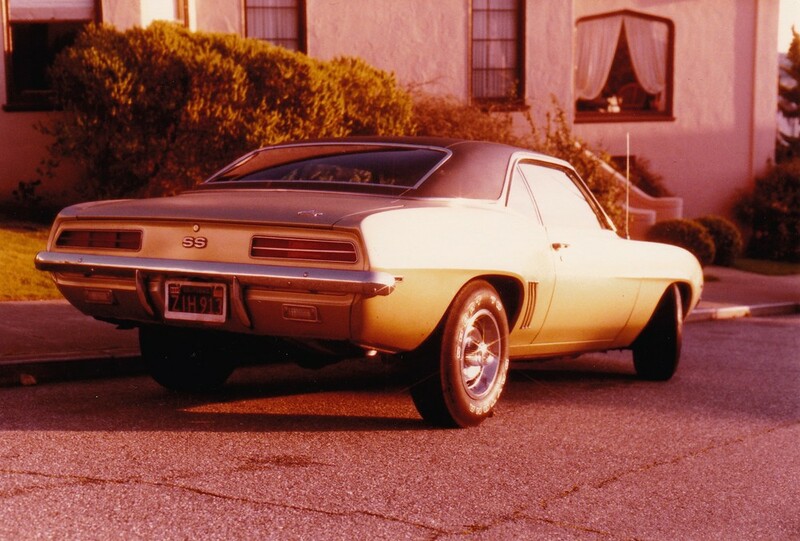 Opportunities to drive the Camaro were more limited than in the past. In 2006 we moved again for work, this time to China. For lack of any good options, the car was given an ungracious storage in a carport canopy for 5 years. The positive side to this derelict decision however accelerated the need and fueled the desire for a full restoration. The original engine was again rebuilt for good measure. This time it received a hotter Voodoo cam and an Edelbrock manifold (painted orange). I regret using Stainless Steel Works for the headers. They fit like they should now but only after a huge unnecessary hassle to get corrected. The notable change to the car was swapping the TH400 for a correct M20. This was one of the main reasons I hesitated buying the car. I bought the rebuilt 4 speed and linkage from Steve back in the late 90’s. I always knew I wanted a 4 speed with 373 posi. I labored over the swap thinking it was no longer going to be original. This is where Steve’s wisdom shines, he told me “Dave, it’s your car” and the decision was made. The TH400 and all the related parts are safely tucked away. Who knows, I might need them in my golden years. Lots of pictures, notes, bags and tags were key to recording everything before it was disassembled. I kept everything, even if I knew it was going to be replaced. I’d use it for bits of hardware, examples of assembly and compare quality to the reproduction parts. I started buying NOS parts from Steve in the 90’s. Steve was a great source of knowledge, support and access to the correct parts. I figured it was easier on a budget to buy parts early over time and store them away. This financially less painful method was great, but I then learned some reproduction parts have gotten much better over the 15 years. I’ve since replaced the old reproduction console for a new one. The cost was off set by selling it and other older reproduction parts at swap meets and Craigslist. I should have saved the money until I needed the part in hindsight. It was an easy decision to trust Long Valley Auto Body here in New Jersey with the car. They had done a great job on another car I have and my wife’s daily driver. I did the easy part such as dismantling, organizing the parts, polishing stainless steel, rebuilding the dash, installing carpet over sound deadener, etc. They did the professional work. John and Doug made it look easy replacing and test fitting panels, putting everything big and small in its correct place. They understood the goal to get it right and made the build a pleasure. The Definitive 1969 Camaro Z28/SS396 Fact Book by Jerry McNeish was the bible for getting it right and an invaluable resource. I contacted Mr. McNeish for a clarification on the level of gloss at the back panel not expecting a response. I was just another guy working on his car or so I thought. To his great credit, I was very grateful for his helpful response! This is a wonderful past time with some genuinely good people. The car now has just over 500 miles and was not over restored. It has gobs of power on demand and handles with the best of them. It’s a better than new clean car meant to be driven as often as possible. It will no longer be parked in a leaky barn, or by the curb every night in the rain, used for everyday commuting, stuffing a new TV in the back seat just in time to get home for Miami Vice, and transporting 6 adults for example. It feels like 1981 every time I get in the Camaro. Thanks Alan for nagging me to just go look at it. I’ll drive it like it was intended until I’m the same temperature as dirt. Then it’s up to my son what happens next. They say you can never go back. They’re wrong, you can.